Thanks to a grant from El Camino Healthcare District, low-income patients in north county are able to receive top-notch dental care at the Valley Health Center Sunnyvale clinic. Over the past year, VHC Sunnyvale has served 874 dental patients, performing emergency, restorative, and maintenance dental procedures. 94% of the patients served are eligible for the Medi-Cal Dental Program. 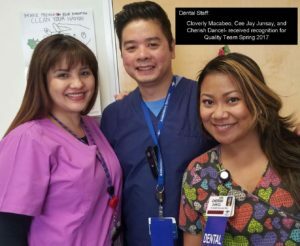 El Camino Healthcare District has been a long-time supporter of dental services provided at VHC Sunnyvale, and we are very grateful! Click here to learn more about ECHD’s Community Benefit Plan for 2017. Can’t get enough of 2016? Check out our Annual Report Our First Ever Scavenger Hunt!